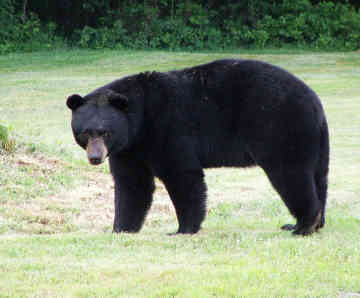 US researchers have found that black bears have a surprising capacity to heal while hibernating. Medical researchers and zoologists worked together to find that the bears’ wounds healed with almost no scarring, and were infection-free. The scientists hope, eventually, to find out exactly how the bears’ bodies heal while their body temperature, heart rate and metabolism are reduced. This could aid studies of human wound-healing. The findings, published in the journal Integrative Zoology, are of particular relevance to medical researchers hoping to improve slow-healing and infection-prone wounds in elderly, malnourished or diabetic patients. This study was part of a project by scientists from the universities of Minnesota, Wyoming and the Minnesota Department of Natural Resources, who have tracked 1,000 black bears, in order to monitor their health and behavior, for 25 years. Whilst tracking the bears – using radio collars – the researchers noticed some early evidence of their surprising healing abilities. Researchers wrote in their paper: “We identified a few animals each year with injuries resulting from gunshots or arrows from hunters; bite marks from other bears or predators. “These wounds were considered to have been incurred some time before the bears denned, and were often infected or inflamed… in early winter. To test the bear’s healing abilities experimentally, the team carefully tracked the healing of small cuts on the skin of 14 of their radio-collared bears in northern Minnesota. Between November (when the bears first settled down in their dens) and March (about a month before they emerged) the wounds healed with “minimal evidence of scarring”. Added to this, there were no signs of infection, the layers of damaged skin regrew and many of the bears even grew hair from newly formed follicles at the site of their injuries. But, he added, the animals had many other “remarkable adaptations to hibernation”. “They sit in the den for six months and don’t lose any appreciable muscle or bone mass, so I guess this healing is another adaptation,” Prof. David Garshelis said. During its winter hibernation, a black bear’s core body temperature is reduced by as much as 7C (13F) and their heart rate lowers dramatically. In humans, a lowered body temperature, or conditions that hamper circulation can seriously complicate wound-healing. For this reason, the team hopes to find out the mechanism behind the bears’ remarkable healing abilities. Prof. David Garshelis: “We consider this to have implications for medical research. This could be especially important for the development of treatments for slow-healing skin wounds in malnourished, hypothermic, diabetic and elderly patients.